We designed the Orbit-K Blood Pressure Cuff, specifically for cardiac stress and exercise testing applications. It enables repeated, reliable blood pressure measurements to be taken by maintaining proper placement for the length of the cardiac stress test - all while ensuring patient comfort is of the utmost priority. The Orbit-K Blood Pressure Cuff comes standard with our Tango M2 Stress Test Monitor and even has an added pocket to secure the microphone along the brachial artery. 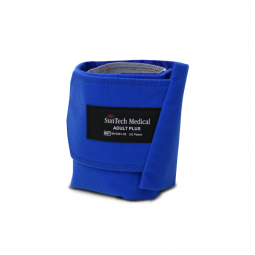 SunTech®’s patented Orbit-K ™ blood pressure cuff is designed specifically for Cardiac Stress and Exercise Testing applications. 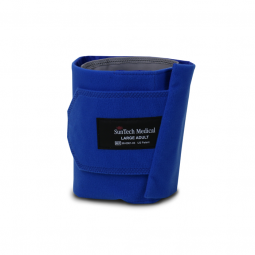 This cuff is designed with a soft, supple sleeve that gently hugs the arm and has a pocket to secure the microphone along the brachial artery. This sleeve enables the blood pressure measurements to be repeatable and more reliable by maintaining proper BP cuff placement during the entire length of the cardiac stress test. 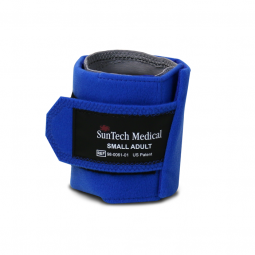 Orbit-K blood pressure cuffs come standard with SunTech Medical’s Tango M2® blood pressure monitor that is specifically designed for use in treadmill, bicycle (ergometer), and pharmacological stress testing. 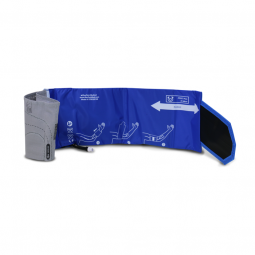 Patient Comfort: Soft, supple sleeve made of lycra/nylon stretch material, gently hugs the arm to maintain BP cuff placement and promote patient comfort. Durability: Value in a long-lasting, high quality BP cuff material provides a durable yet comfortable cuff solution for repeated readings on multiple patients. Easy Cleaning/Disinfecting: High quality material with a removable bladder makes it easier to clean, disinfect, or machine wash the blood pressure cuff. Ease of Use: Innovative design that allows a clinician to properly position the BP cuff on the arm. The cuff sleeve contains an added pocket to secure the microphone in the proper listening position on the brachial artery to obtain accurate, repeatable, and reliable blood pressure measurement results during cardiac stress testing. Reliable: 100% leak tested for trust, value, and reliability. Regulatory: Engineered to meet AHA, AAMI-SP10, and MDD guidelines for accurate results you can trust. Need more information or pricing? Request more information or a quote here and learn how we can be the difference in clinical grade for you! You can find out more by clicking here for a useful video tutorial. How do I clean the Orbit-K™ Cuff? Medical Disinfectant Spray - The cuff may be sprayed with a mild disinfectant solution (e.g. Cidezyme®, ENZOL®, or 10% bleach solution), rinsed with distilled water, and line dry. Ensure that no liquid enters the bladder tubing. Medical Disinfect Wipe - Use a mild disinfectant wipe (e.g. Sani-Cloth®) and thoroughly wet cuff surface and line dry. Machine Wash - Remove bladder and K-sound Microphone to machine wash the cuff shell. Machine wash warm (50–130°F, 10–54°C) with a mild detergent and line dry. How do I clean the K-sound Microphone? The K-sound Microphone can be cleaned using a mild disinfectant wipe (e.g. Sani-Cloth®) and letting the microphone line dry. Will my Tango+ K-sound Microphone work with my Tango M2? No, the connector of the K-sound microphone used with the Tango+ is different than the connector of the K-sound microphone used with the Tango M2. Please see the Technical Specs Tab to view which Orbit-K cuffs will work with which stress BP monitor. Thank you for your interest in proper application of the Single Patient Use kits, the cuff Infection Control option designed specifically to work with the Tango Stress BP Monitor. Thank you for your interest in proper cuff placement as it relates to the Orbit-K cuff. Within this video you will see how to properly apply this unique cuff and position the k-sound microphone. Thank you for your interest in learning proper cuff placement as it relates to the Orbit-K cuff. Within this video you will see how to avoid improper placement of this unique cuff. This video shows the proper techniques for cleaning the Orbit-K Cuff which are used with the Tango M2 Stress BP Monitor. Is your Stress Lab following best practice for patient safety and accurate data? Download the "Tips for Accurate Cardiac Stress BP Measurement Poster" for free and print it for your own lab. Get $500 towards a new Tango M2 when you trade in any Tango or Tango+ Stress Test Blood Pressure Monitor. Offer valid until March 31st. Other restrictions apply. Discover the Difference with the Tango M2 Today! Request more information about the Tango M2 by using this form.